As you can see, from the photos and stories below about the things our cats get up to. We all love our cats, no matter what they do. A big thank you to everyone who sent these in. 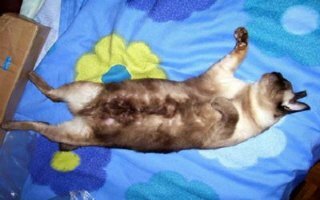 Let's start with this gorgeous picture of six-year-old Blue Point Siamese, Roo, sent in by Dee, from Kingston, Ontario, Canada. There was no story, just the photo, but what a beautiful Blue Point! 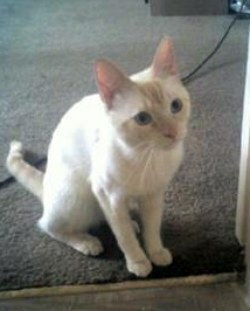 My two-year-old Flame Point Siamese Pan loves to be around us ... we've tried to shut him out of the room at night to sleep (or do anything else, if you know what I mean!) but he will not have it! He slides a paw under the door and jiggles it till someone comes. Sometimes it drives me crazy but I love him. He also opens the screen doors by hooking a claw in the side! He was found on the streets and boy is he resourceful with those claws ... I've actually seen him scoop up cat food in his paw and feed himself if he can't get his head in the bowl for the last bite or two. Our cat is an indoor cat, but we take him out once or twice a week. Well, evidently that's not good enough for him because just recently he's been jumping up and turning the doorknob to the front door! If it wasn't locked he'd get out, he's really strong! Oh, and so lovable. Here's a picture of my baby – he's a year old. My Siamese, Miko, and I have a special greeting when we snuggle. I nuzzle his head and then his chin and let him smell my hairline and then he grooms my hairline just briefly. We have been doing this since I was five. And I've never seen him do this to anyone else! I'm twenty-one now, and … oh gosh I'm getting teary eyed … it is my favourite greeting when I come home. He's getting older now, of course, but some things never change. He still goes crazy for a can of tuna! My six-year-old applehead Siamese cat, Sassy, loves going into the bathroom, where she likes eating toilet paper. When you're done going to the bathroom and get up from the toilet she will jump on the seat, wait for the water to go down, watch it fill up and stick her head in the bowl and drink. When someone's in the shower she will cry at the door until she gets in the bathroom. She doesn't like milk, doesn't like catnip, but she is the sweetest most active thing in the world. She loves playing hide and seek (she always wins!) and she also loves to play tag. I'll run after her and tap her and turn around and run, and she will run in front of me and sit down quickly! It's very cute. I love my cat Sassy – she's a very affectionate cat, and not only with me. I have three cats altogether; Shasha is eight, a Mau who's a very mean cat, then there's Domino, age seven who weighs about 20 pounds! When Sassy and Domino get around each other its like a love fest – it's crazy! All in all I love my animals, including my two dogs. We have one boy and one girl cat who always seem to hide behind the vacuum cleaner. When we go downstairs or leave the house they try to stop us. It's so funny! And when we cook they try to eat all they can before we notice. They're such lovable kittens! My Lynx Point Siamese is a guard cat! When he hears someone outside my apartment door, he runs to me ... looks at the door, puts his ears back and growls. He is very protective of his kingdom and his Queen (me) =). He is my sweetie. 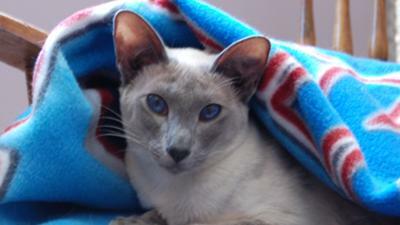 I have a six-year-old Blue Point Siamese called Joe Minx. When he was eight weeks old I picked him up and fell completely in love! After playing for hours he decided to take a catnap in my lap. He was very sleepy when he looked up at me ... and his eyes were completely crossed. At first I tried not to freak out, I decided it was because he was extra sleepy. Over the next couple weeks I kept looking ... and I didn't notice anything. Then one day we were sitting on the couch and it happened again. This time he seemed like he wasn't able to uncross his eyes ... I freaked! I started panicking, ran to the phone and called the vet immediately. I literally screamed into the phone "my kitten's eyes are crossed, what do I do?" The lady on the phone said, "calm down ... is your kitten Siamese or part Siamese?" "Yes", I replied "he's a Siamese kitten". She laughed and said "don't worry, it's just a trait of the breed". Thank God! This story set the tone for what was in store for me ... he is a very dramatic, very high maintenance, and MOST WONDERFUL boy ever. I am so thankful to have my little prince! 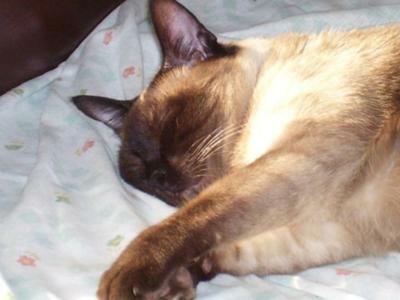 Mimi is my ten-year-old Siamese cat. Once before I had a funny and lovely Siamese cat that died, then I bought this one and gave her the same name in remembrance. But this Mimi is … completely different. She is kind and loves our company, but she is the laziest Siamese cat in the world, in fact she is always resting, doesn't like playing (not even as a kitten) so I can put everything near her and know she won't damage it. She's never asking for food, she only eats dry cat biscuits, and doesn't give a damn about meat or fish, in fact I think I could lay a beef near her and walk away. If she smells it, that will be more than enough because she just doesn't care about that. She's never hungry but she does eat many times during the day, not one meal but tiny meals from time to time (1 or 2 biscuits) and, if she's hungry (because her plate is empty) most probably she only sit watching the plate waiting for us to fill it (if she's very hungry then she will meow to us). Reading this you may think she's very thin but, wrong! She's a fat, almost obese cat due to her laziness, and only eating what she likes, those dry biscuits. Most of the time she's taking naps. She's very jealous of the birds in the house when I feed them, but her reaction is to sit near my legs watching till I figure she's there. 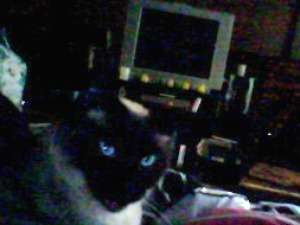 My lovely Siamese is a very passive lazy doll that demands attention and company but nothing more than that. My other cat was equally lovable but used to be always hungry, steal food, play a lot and was slim ... this one is has been heavy and lazy since a kitty. But I love her, and she is the first cat I ever had that never broke anything, being so calm. Last month she fell from the third floor and while not breaking anything (luckily) she never went outside anymore, maybe being scared of that? I just can't figure out why she fell from the balcony, she never used to go outside on her own for more than five minutes - not even in summer, and she does love sun baths. But she's ok and right now she's sleeping till I go to bed and she will demand to stay close to me and purr for 20 minutes! Comments for I Love My Cat! and daddy was a traveling barn cat. 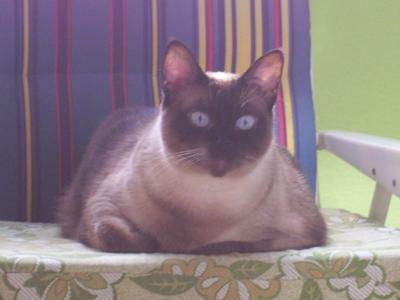 From this came Little Midnight; a tiny slip of a girl, with a Siamese look and temperament. She was also black. Little Midnight was a wild thing from the day I brought her home as a tiny kitten and never slowed down. She was a curtain climber and no amount of water from a spray bottle could stop her. I swear she fairly shouted "WHEEE!" as she swung there dripping wet! The curtains eventually had to go. And speaking of water, I was never allowed to shower without a spotter lest something bad happen. Midnight was always there peaking around or thru the curtain. One of Midnight's favorite games was to hide 'round the corner when she heard my 5-year-old coming down the hall. Then, just as she was about to enter the room, Little Midnight would LEAP into the doorway, standing sideways, puffed up, fully enjoying the show as my daughter would scream and stomp her feet, yelling. She also loved to hunt lizards, birds, and mice. Of course she practiced "catch & release"... in the house! She SO enjoyed indoor hunting with the family! And she was a klepto; neatly piling hair bands & clips, earrings, etc, under my bed. Her whiskers were also eternally crumpled because she enjoyed sitting with her head under the table lamp shade, toasting her cheeks... and melting her whiskers! The dog was her servant. When she wanted her ears cleaned, she would lay down and grab his cheeks, pulling his head down. Afterwards, if not satisfied, she'd grab his cheeks again! Every night at 10:30, Midnight would stand in the hall door demanding EVERYONE go to bed NOW! She was tired, so obviously it was up to her to make sure the entire household was in bed at the proper time ... HER proper time! She would get downright crabby when we stayed up for the news. Little Midnight was loving and playful, vocal and clever, and determined when she wanted something. She liked to stand on your shoulders when walking around, played fetch, and could even open doors by hanging from the door knob. She was a great little cat, who lived to be 19 and is still missed.